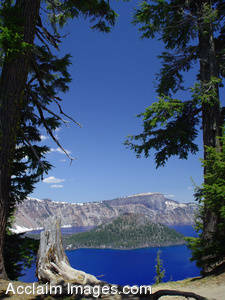 Description: Stock Photo of Crater Lake National Parks Wizard Island. Wizard Island stands alone in the corner of Crater Lake National Park's Lake. It can only be reached by boat. You may license this image as stock photography or purchase it as an art print or a poster.